Home > About....Knowing More > How to take care of silver jewelry? Regularly cleaning sterling silver jewelry will preserve the original appearance of your silver necklaces, bracelets and earrings. 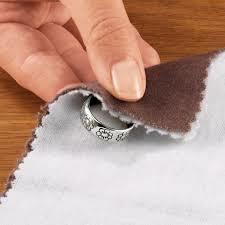 Clean them right after use by wiping off perspiration, make up and other elements with a cotton cloth before putting them back in your jewelry box. Steer clear of household substitutes like ultrasonic cleaners, ammonia or other improvised chemical cleaners. They might do your sterling silver jewelry more harm than good. NEVER immerse antiqued finished (blackened effect) silver pieces or freshwater pearls in the silver cleaner. It will instantly strip the pieces of all finishes and this is irreversible. Swarovski Glass pearls CAN however be cleaned safely in the silver cleaner. Part of jewelry care is learning when to put on or take off your sterling silver accessories to prevent corrosion as well as damage. Put them on last - meaning after you’re done applying lotion, make up, hair styling product and perfume to protect them from these sometimes harsh chemicals. Take off your silver jewelry before swimming, going to the spa or a mineral spring, or doing household chores where it may come in contact with chlorine, salt water, or cleaning agents. Be sure to remove all jewelry before engaging in any sports activities, bathing and before sleeping. DO NOT store your sterling silver jewelry on top of your dresser or bathroom vanities. Precious metals naturally oxidize when exposed to the air, and keeping it out in the open will accelerate the process. Can't stress this step enough. Store your jewelry in a jewelry box where it is less likely to move around and get damaged. An anti tarnishing lined jewelry box is ideal (Google it, Yes they are out there, and are AWESOME!) or an air tight plastic zip top bag.